It is said that this was the crest of the Ward family and to it Mary Ward added the two hearts. It is still to be seen in Ripon Cathedral – the area of Yorkshire where the Ward family lived. The CROSS in the top left corner as you look at the crest symbolises her and our faith in Christ our leader who won salvation for all by his death on the cross and his resurrection. The ANCHOR at the bottom right hand corner is the symbol of HOPE, which should inspire us, as it inspired Mary Ward, to meet the challenges of our daily life in a firm conviction that Christ will be faithful to us irrespective of any failures on our part to continue on our path and trust in Him until the end. This virtue anchors our life in our Lord’s loving care and fidelity to each and all. 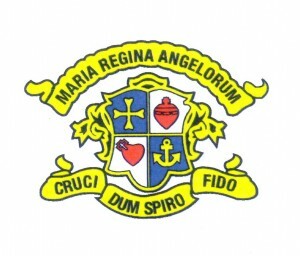 On the two other corners are the HEARTS OF JESUS AND MARY, added to the family crest. Our Lord’s side was pierced on the cross and Simeon prophesied that Our Lady’s heart would be pierced by the sword of sorrow so that she might share with the children whom Our Lord entrusted to her, “Your own soul a sword shall pierce so that the thoughts and needs of many may be shared with you.” These words are being fulfilled today by the thousands of people of all ages and all nations who have recourse to her at her various shrines. These symbols represent LOVE. Firstly, her willing co-operation in what God made know to her. This wish was made known through his messenger, the Angel Gabriel. The angel said, “…the Lord is with you. You are to bear a son and you must name him Jesus. He will be called the son of the Most High and he will rule over the House of Jacob for ever. His reign will have no end. The Holy Spirit will come upon you and the child will be holy and called Son of God.” Mary answered, “I am the handmaid of the Lord. Let what you have said be done to me.” The angel then left her. Secondly, her loving concern for other people through the presence of Christ in her womb and utter forgetfulness of self. Immediately after the angel left her, she set out on a long and dangerous journey on foot through the hills of Judea to visit her kinswoman Elizabeth who was awaiting the birth of her son, John the Baptist and Mary lived there, helping in the house for three months. REGINA – QUEEN – A queen is responsible for the interests of her people within her kingdom. ANGELORUM – OF ALL THE ANGELS – An angel is one sent by God as a messenger. How are you preparing for eternity?